Someone has been stealing the drawings the chalks have been leaving on the blackboard and the chalks are appalled. Luckily, the culprit have left a trail of red dust, so Sergeant Blue takes on the case. Can they find the culprit? This is a great first introduction to the whodunit genre, set within familiar realms for the audience which allows them to guess ahead of the chalks who might be to blame. 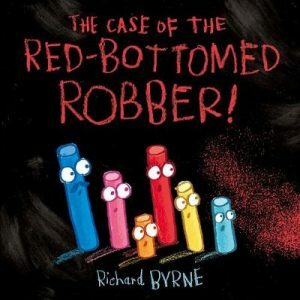 Byrne’s artwork is brimful of colours and energy, and the blackboard background on all the spreads is really effective. Lots of humour within the artwork (the line-up spread is a delight) keep the story light-hearted, and supporting the subtle message that we should not judge others too quickly without being preachy. A fun, engaging read! A fun, interactive book all about items of clothing and getting dressed, this ‘You Choose’ -type book includes twelve double-spreads crammed with details for young readers to pore over. A penguin wearing pants on its head, a flamingo wearing banana peels for shoes or an elephant with a sock on its trunk, are only a few of the hilarious characters readers will come across in those brightly coloured spreads. There is plenty of silliness going on the pages of course, with speech bubbles adding an extra dose of humour. With the same animals recurring on each spread, there is plenty of searching to do to find one’s favourite, and amidst all the fun also offers a great platform for discussion between child and adult. A bright, fun book. This unusual story is wonderfully philosophical and explores the world around us through colour with my lyricism. It touches on many themes aside from colour: seasons, feelings and how children see and understand the world. The unconventional narrative really cleverly mirrors children’s thought-processes and how they might approach abstract concepts and it is accompanied by beautifully vibrant watercolour artwork. The illustrations convey movement beautifully, and there is so much energy bursting through the pages. This is a beautiful celebration of the world around us, offering us a child’s perspective, full of awe and full of the little details we might take for granted or simply fail to see and wonder about. 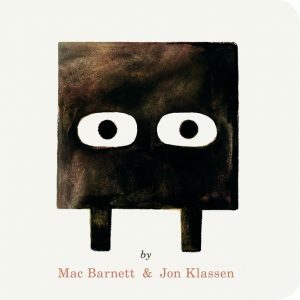 In this new instalment in Barnett and Klassen’s shape trilogy, we meet Square again, whose job is to push blocks out of his secret cave. That’s it. But when Circle passes by and mistakes his rocks for auto portrait sculptures, Square finds himself under pressure to create a piece of art for Circle. The multi-layering of Barnett and Klassen’s narratives is outstanding. Purposely ambiguous and deadpan, with a hint of the absurd perfectly pitched for children, they manage to entertain while exploring some rather existential themes. In this instance: what is art? Is there such a thing as perfect? And for the parents, some sympathy will be felt towards Square and his bout of imposter syndrome. Clever, funny and utterly unique, this creative duo do not cease to amaze. I cannot wait to read Circle’s adventure! What happens inside a picturebook if the characters turn up but the story hasn’t yet? The creatures in this book choose to wait patiently, apart from the little pink rabbit, who soon gets bored and takes matters into its own hands. 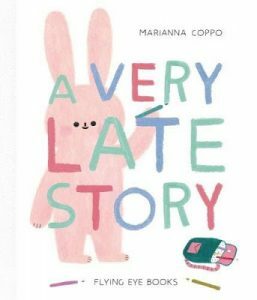 Coppo marries a soft pastel palette and delicate style with minimal text , creating a really enjoyable metafictive picturebook. The narrative opens and closes with the same double spread : blank, with the single sentence “Once upon a time, there was a blank page”. Blank pages make a bold statement to their readers which is potent here: the reader is invited to ‘fill’ the page, so to speak, and in this case it goes hand in hand with the subtle message of the narrative about being in charge of one’s own story and destiny. Marianna Coppo is one illustrator to watch!